Frozen Secrets: Antarctica Revealed by Sally M. Walker. (Grades 6-10.) Carolrhoda Books, October 2010. 104 pages. Review copy provided by publisher. Antarctica: our vast, icy southernmost continent. Winds can blow at 200 miles per hour and the temperature can plummet well below zero. But it wasn't always this way. What did Antarctica look like millions of years ago? How is our changing climate affecting this frozen continent? What hidden things may lie in the depths below miles of ice? And just how is a scientist supposed to do research down there when it's so frickin' cold?! There's no doubt about it: the miles of ice that cover Antarctica hold secrets about the past. Air bubbles, dust, and volcanic ash trapped in the ice for hundreds of thousands of years may hold clues to what the continent was like long ago and how it's changed (and continuing to change). How do scientists get this information? Carefully and with lots of hard work! 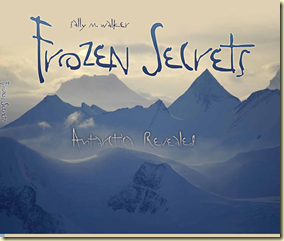 In Frozen Secrets, Sally M. Walker brings readers along on a trip to Antarctica. Scientists have to undergo special survival training and wear special gear to study there. They also use special tools. Scientists can use certain radar waves to measure the thickness of the ice (the ice in Antarctica is almost 3 miles thick in some places!). They also use powerful drills to collect samples of ice from thousands of feet down and underwater robots to study the lakes and oceans. Antarctica gets an average snowfall of only 2 inches per year! Scuba divers in Antarctica wear "dry suits" instead of wet suits. They are special suits that go on over whatever clothes they're already wearing, keeping them dry and warm with a layer of air for insulation! There are educational outreach programs that send school teachers to Antarctica with scientists so that they can share their experiences with their students! There are liquid lakes found under miles of ice in Antarctica! There have been dinosaur fossils found in Antarctica! And, of course, the book is plenty detailed and has excellent source notes, making it great for report-writing. I'd expect nothing less from Ms. Walker. Frozen Secrets is an information-packed trek through the mysterious frozen continent of Antarctica. There's a little something here for everyone: robots, dinosaurs, survival skills, environmental issues... All complete with color photos and a neat layout that puts the text on top of a background of ice, making a visually pleasing and informative book. Frozen Secrets will be on shelves October 1. Happy Nonfiction Monday! Check out the roundup at Rasco from RIF!